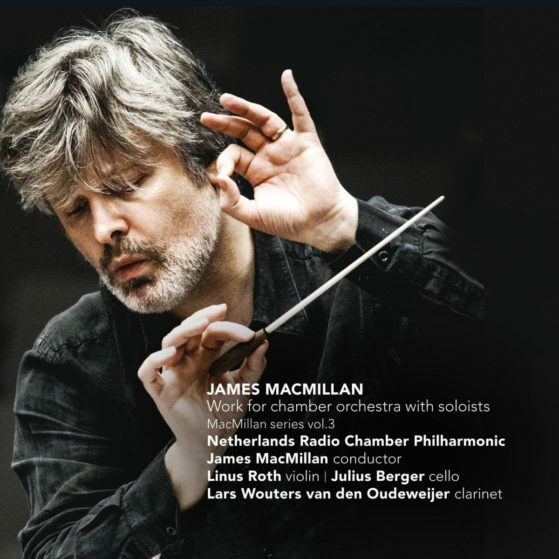 It is something of a cliché to observe that James MacMillan’s music reflects both his spiritual and his social engagement, and that very often these two aspects of his work come together and complement each other. Nevertheless, the music on this recording shows how such concerns genuinely do make themselves felt in the composer’s chamber and orchestral work. While Kiss on Wood has a specific spiritual dimension, the other three works all have links to MacMillan’s native Scotland, whether historical (as in …as others see us…), geographical (as in From Ayrshire), or mining deep cultural layers in order to react to very contemporary concerns (as in Tuireadh). The title of From Ayrshire, scored for violin and orchestra and written in 2005 for Nicola Benedetti, arose, says the composer, from their both having Ayrshire backgrounds. The first movement is certainly nostalgic. The second is altogether more earthbound, it is an explosion of energy, a bounding release from melancholy. Melancholy is the dominant emotion in Tuireadh (1991). The work (for clarinet and string orchestra) is an instrumental requiem for those who lost their lives in the Alpha Piper North Sea oil and gas rig disaster in 1988. The title of the work is the Gaelic word for “lament”, and the austere, folk-inflected quality of much of the writing suggestsprecisely a keening, a communal wailing for the departed. Kiss on wood for solo cello and strings is, as the composer said, a devotional work. …as others see us…, scored for chamber orchestra, is a musical depiction of seven portraits in the National Portrait Gallery in London. They are all portraits of English people: Henry VIII, the poet John Wilmot (Earl of Rochester), John Churchill (Duke of Marlborough), Lord Byron, William Wordsworth, T.S. Eliot and the chemist Dorothy Hodgkin. Linking together these seven portraits of portraits, so to speak, is a Scottish dance tune, which is varied in each section in order to reflect the character of the person portrayed and the historical period.